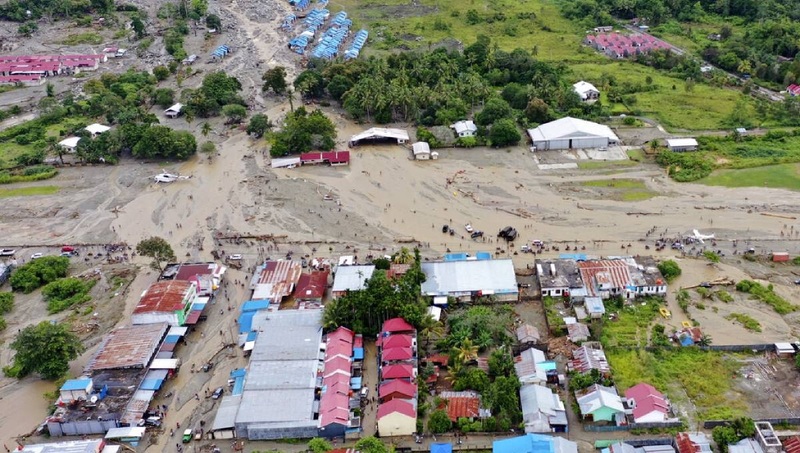 Photo: This aerial shot taken on Sunday, March 17, 2019 shows the area affected by flash floods in Sentani, Papua province, Indonesia. Jayapura, Mar 19 : The death toll from flash floods and mudslides triggered by torrential downpours in eastern Indonesia has risen to 89, with dozens of others missing. National Disaster Mitigation Agency spokesman Sutopo Purwo Nugroho says the worst-hit area from the flooding was Sentani subdistrict, where tons of mud, rocks and trees from a landslide on a mountain rolled down to a river that burst its banks, sweeping away residents. He said Tuesday that 89 bodies had been pulled from the mud and wreckage of crumpled homes and 159 people were injured. Rescuers were searching for 74 residents reportedly missing. Papua military spokesman Col. Muhammad Aidi said more than 1,600 rescuers, including police and soldiers, were facing difficulties clearing huge piles of debris due to shortages of heavy equipment.